"I'll be watching over you." 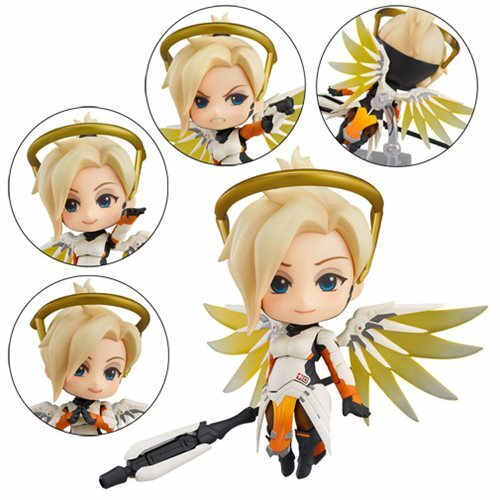 Support your action figure collection with this Overwatch Mercy Classic Skin Edition Nendoroid Action Figure, featuring the support hero Mercy. The healer from the super-popular first person shooter Overwatch comes with three face plates including her standard gentle expression, a smiling expression as well as a tougher expression more suited to combat scenes. This Nendoroid action figure is fully articulated and her wing can move or be removed, allowing you to pose Mercy in a wide range of dynamic poses. The wings feature translucent parts which replicate their appearance in the game. This action figure comes with interchangeable parts for her staff as well as effect parts, which allow you to replicate the in-game healing effects. This plastic Overwatch Mercy Classic Skin Edition Nendoroid Action Figure is approximately 4-inches tall and comes with a stand. Ages 15 and up.